Item: i71632 Authentic Coin of. 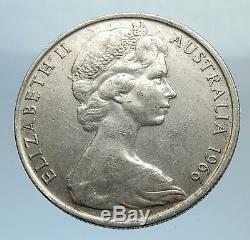 Queen: 6 February 1952present 1966 Silver 50 Cents 31.5 mm (13.21 grams) 0.800 Silver 0.3416 oz. ASW Reference: KM# 67 ELIZABETH II AUSTRALIA, 2nd portrait of Queen Elizabeth II facing right wearing the Girls of Great Britain and Ireland Tiara, year. 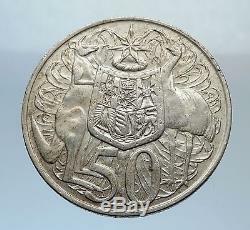 50 SD Australian coat of arms with large numerical denomination below. The round Australian 50 cent piece was introduced at the changeover to decimal currency in Australia in 1966. It is the only circulating round 50 cent piece, containing 80% silver and 20% copper. It was not long before the value of the silver content far outweighed the fifty cent face value and it was withdrawn from production and replaced in 1969 with the dodecagonal (12 sided) shape. Despite them being withdrawn from circulation many millions of the coins were hoarded by the Australian public. Available for sale in my store. Elizabeth II Elizabeth Alexandra Mary; born 21 April 1926. Is, and has been since her accession in 1952, Queen of the United Kingdom, Canada, Australia, and New Zealand, and Head of the Commonwealth. She is also Queen of 12 countries that have become independent since her accession: Jamaica, Barbados, the Bahamas, Grenada, Papua New Guinea, Solomon Islands, Tuvalu, Saint Lucia, Saint Vincent and the Grenadines, Belize, Antigua and Barbuda, and Saint Kitts and Nevis. Elizabeth was born in London to the Duke and Duchess of York, later King George VI and Queen Elizabeth , and was the elder of their two daughters. She was educated privately at home. Her father acceded to the throne on the abdication of his brother Edward VIII in 1936, from which time she was the heir presumptive. In 1947, she married Prince Philip, Duke of Edinburgh , with whom she has four children: Charles , Anne , Andrew , and Edward. Elizabeth's many historic visits and meetings include a state visit to the Republic of Ireland and reciprocal visits to and from the Pope. She has seen major constitutional changes, such as devolution in the United Kingdom, Canadian patriation , and the decolonisation of Africa. She has also reigned through various wars and conflicts involving many of her realms. She is the world's oldest reigning monarch as well as Britain's longest-lived. In 2015, she surpassed the reign of her great-great-grandmother, Queen Victoria , to become the longest-reigning British monarch and the longest-reigning queen regnant in world history. Times of personal significance have included the births and marriages of her children, grandchildren and great grandchildren, her coronation in 1953 , and the celebration of milestones such as her Silver , Golden and Diamond Jubilees in 1977, 2002, and 2012, respectively. Moments of sadness for her include the death of her father, aged 56; the assassination of Prince Philip's uncle, Lord Mountbatten ; the breakdown of her children's marriages in 1992 (her annus horribilis); the death in 1997 of her son's former wife, Diana, Princess of Wales ; and the deaths of her mother and sister in 2002. Elizabeth has occasionally faced republican sentiments and severe press criticism of the royal family , but support for the monarchy and her personal popularity remain high. Australia , officially the Commonwealth of Australia , is a country comprising the mainland of the Australian continent , the island of Tasmania , and numerous smaller islands. It is the world's sixth-largest country by total area. Neighbouring countries include Indonesia , East Timor and Papua New Guinea to the north; the Solomon Islands and Vanuatu to the north-east; and New Zealand to the south-east. For at least 40,000 years before the first British settlement in the late 18th century, Australia was inhabited by indigenous Australians , who spoke languages grouped into roughly 250 language groups. After the European discovery of the continent by Dutch explorers in 1606, Australia's eastern half was claimed by Great Britain in 1770 and initially settled through penal transportation to the colony of New South Wales from 26 January 1788. The population grew steadily in subsequent decades; the continent was explored and an additional five self-governing crown colonies were established. On 1 January 1901, the six colonies federated , forming the Commonwealth of Australia. Since Federation, Australia has maintained a stable liberal democratic political system that functions as a federal parliamentary democracy and constitutional monarchy comprising six states and several territories. The population of 23.6 million. Is highly urbanised and heavily concentrated in the eastern states and on the coast. Australia is a developed country and one of the wealthiest in the world, with the world's 12th-largest economy. In 2012 Australia had the world's fifth-highest per capita income. Australia's military expenditure is the world's 13th-largest. With the second-highest human development index globally , Australia ranks highly in many international comparisons of national performance, such as quality of life, health, education, economic freedom , and the protection of civil liberties and political rights. Australia is a member of the United Nations , G20 , Commonwealth of Nations , ANZUS , Organisation for Economic Co-operation and Development (OECD), World Trade Organization , Asia-Pacific Economic Cooperation , and the Pacific Islands Forum. World-renowned expert numismatist, enthusiast, author and dealer in authentic ancient Greek, ancient Roman, ancient Byzantine, world coins & more. Ilya Zlobin is an independent individual who has a passion for coin collecting, research and understanding the importance of the historical context and significance all coins and objects represent. What is a certificate of authenticity and what guarantees do you give that the item is authentic? You will be very happy with what you get with the COA; a professional presentation of the coin, with all of the relevant information and a picture of the coin you saw in the listing. Additionally, the coin is inside it's own protective coin flip (holder), with a 2x2 inch description of the coin matching the individual number on the COA. Whether your goal is to collect or give the item as a gift, coins presented like this could be more prized and valued higher than items that were not given such care and attention to. When should I leave feedback? Please don't leave any negative feedbacks, as it happens sometimes that people rush to leave feedback before letting sufficient time for their order to arrive. The matter of fact is that any issues can be resolved, as reputation is most important to me. My goal is to provide superior products and quality of service. The item "1966 AUSTRALIA UK Queen Elizabeth II SILVER 50 cents Coat-of-Arms Coin i71632" is in sale since Sunday, November 25, 2018. 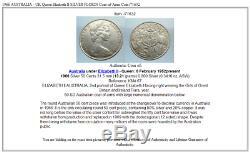 This item is in the category "Coins & Paper Money\Coins\ World\Australia & Oceania\Australia\Pre-Decimal". The seller is "highrating_lowprice" and is located in Rego Park, New York. This item can be shipped worldwide.